This Louisiana-inspired rub is particularly good with salmon. 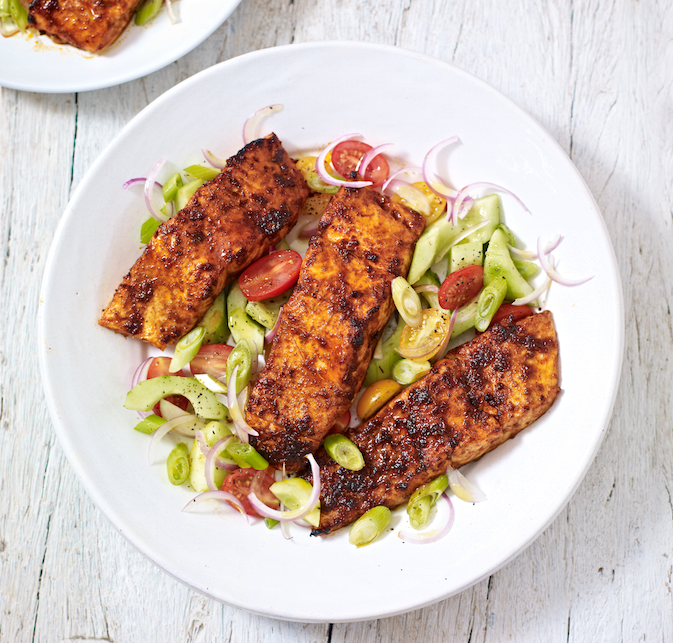 You can serve the salmon with a thinly sliced onion, avocado, and cherry tomato salad for a light, flavoursome supper. 1. Combine the spices, thyme, sugar and salt in a pestle and mortar or a spice grinder. Grind to a fine powder. 2. Rub the mixture over both sides of the fish, cover with cling film and leave to rest in the fridge while you prepare the grill. 3. Preheat the grill on its highest setting and line a grill pan with foil. Brush the fish with a little oil on both sides, being careful not to dislodge the spice rub, and grill for 3-4 minutes on each side, depending on its thickness. TIP: The salmon can be marinated in the rub and frozen, uncooked. Defrost thoroughly before cooking. You can also double the quantity of spice rub and seal the remainder in an airtight jar for future use ­– it’s also great with chicken or sweet potato!